MK Dons face the biggest three weeks in their short history, with five games separating them and relegation to League 2. The stakes don’t come much higher for Dan Micciche and his side. There are 15 points on offer, and 10 points between the team and Micciche’s target of 52 points. The run in will be tough too - Doncaster Rovers, Southend, Bradford City, Scunthorpe United and Shrewsbury Town stand in the way of League 1 safety, and Dons have picked up just three points in the corresponding fixtures this season. Dons head into this Saturday’s penultimate home game against Doncaster off the back of two defeats against the division’s top two - one had promising signs for 45 minutes, the other was a 5-1 drubbing with a former flame at the heart of the torture. The picture facing them is grim, and is considerably uglier than the one predicted at the very start of the campaign. The landscape though is considerably different. There were precious few positives to take from the weekend’s hammering at the hands of Wigan Athletic. The defence looked terrified as Nick Powell, Gavin Massey and hat-trick hero Will Grigg pulled them all over the park, the midfield was over-powered by Wigan runners and the front men barely saw the ball to create anything meaningful in front of goal. The only silver-lining was other results going their way. Speaking afterwards, manager Micciche said he didn’t read his side the riot act. In fact, he said very little to them by way of a team talk. “We haven’t even discussed the game. I’ve just told them to move on,” he said. That time though is running out. Whether you’re a backer of Micciche, willing to give him the time irrespective of where they ply their trade next season, or whether you believe relegation must spell the end of his tenure in charge, the next five games will cement his fate one way or the other. With three wins and three draws in 14 games, Dons near enough where they were when he took over - two points from safety. The only difference is the number of games remaining. 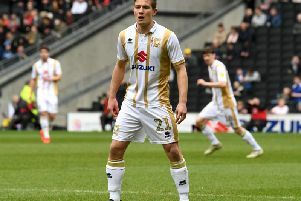 March delivered hope, something which had been missing from Stadium MK for a long while, though back-to-back defeats have knocked a sense of reality back into the club, albeit in a slightly harsh fashion. Micciche’s first win, his swift second, an undefeated spell which stretched four games and escape from the bottom four, even if it was only for a few days. The wins showed the team could do it in different conditions too - a rampant victory, an ugly win, and a win-at-all-costs. The squad have it in them, but for one reason or another, there are blockades in the way of consistency. They won’t be able to afford to let them be in the way in these final five games. Taking the last two games in isolation, maybe Micciche is right to want to sweep the Wigan result under the carpet, forget it, treat it as an anomaly and move on swiftly. But the hurt must remain - Dons cannot afford to feel like that again. A repeat will almost certainly spell League 2 football next season.